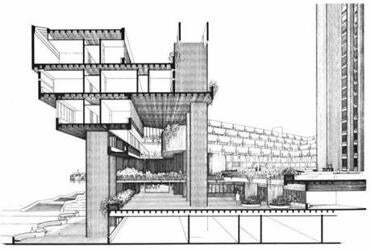 Paul Rudolph’s Government Service Center. Government Center is the architectural complex that Bostonians most love to hate—a windswept, monolithic presence in the center of their 19th-century downtown. City Hall is its most famous and controversial building, but not far away stands one even stranger and more forbidding: the concrete brutalist castle between Staniford, Merrimac, and New Chardon streets. 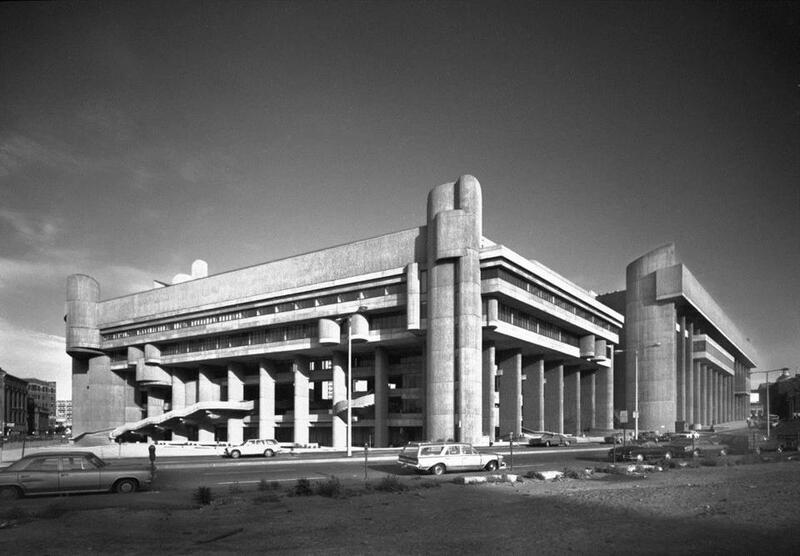 This is the Government Service Center, designed by architect Paul Rudolph. Never completed, it feels to most passersby like just another part of a great civic misstep, a troubled development that exemplifies the most alienating qualities of 1960s urbanism. The Government Service Center is little visited today, and even less loved. But that is, in part, because visitors miss something important about it. Even frequent visitors to the area may not realize that if you step inside, there is revealed a wondrous interior courtyard like something from baroque Rome, a space that even in its incomplete and neglected state contrasts sharply with nearby City Hall and its alienating plaza. This contrast is no accident: Rudolph designed the complex not as yet another bureaucratic bunker, but as a public space that could offer a clear and humane counterpoint to the philosophy that shaped City Hall Plaza. For many reasons, it never quite blossomed as he hoped, but the intentions behind it—and how they did and did not turn out as he hoped—are well worth understanding as we consider the next steps for the complicated urban landscape of Boston’s civic center. The civic vision trapped inside Boston’s most forbidding brutalist palace. In the early 1960s, when Boston sought to rebuild its downtown, the city turned to A-list architects like Rudolph, the influential chairman of Yale’s department of architecture. Still only in his early 40s, the Alabama-born, Harvard-trained designer was seen as a leader within postwar architecture for questioning what had become the orthodoxy of modernism. Rudolph believed the era’s ubiquitous glass-walled office buildings were making American cities monotonous and dull. The solution, for Rudolph and many contemporaries, was concrete: Its solidity recalled traditional masonry buildings, and it therefore could bring to urban centers a monumental character appropriate for a confident, powerful nation. (This type of monumentality became known as brutalism, a term Rudolph never used himself.) His masterpiece was the Yale Art & Architecture Building, famed for its textured, corrugated concrete surfaces. Not surprisingly, Rudolph admired Kallmann, McKinnell, and Knowles’s Boston City Hall. But he found the surrounding plaza too flat, too open, and lacking in landmarks that could give the user a sense of place or direction. He believed that such openness created a feeling of agoraphobia, fear of open spaces—a word coined by the 19th-century urban theorist Camillo Sitte. Choreographing such sequences, he believed, could give form, shape, identity, and direction to the large new urban complexes of the era. And in Boston’s Government Center he had a test case. Originally enlisted to design only one part of a planned three-building complex, Rudolph seized control of the project in 1962 by rapidly sketching in front of the project’s other architects a plan to unite the buildings into linked structures. Together, they would enclose a fan-shaped courtyard; the focal point would be a 23-story tower, the “magnet” that would give direction. To heighten the sense of drama, Rudolph terraced the buildings surrounding the courtyard so that they resembled the stepped-back seats of a theater, suggesting an amphitheater where civic dramas would play out. Rudolph also saw it establishing broader relationships to the city: The courtyard, he said, would form a concave “bowl” that would complement the convex form of nearby Beacon Hill. The sinuous shapes of Rudolph’s Government Service Center were meant as an inviting contrast to the flat expanse of nearby City Hall Plaza. Each element in his new courtyard was intended to create a contrast to City Hall Plaza. Where the plaza was flat, the surface of Rudolph’s interior courtyard was subtly sloped to draw users to a shell-shaped set of curving staircases at the base of the proposed tower. The nautilus staircase would be a meeting place, an unforgettable landmark compared to the relatively featureless City Hall Plaza. Where the plaza gave visitors little direction, Rudolph’s courtyard included lines incised to lead visitors through its varied spaces. In this way, Rudolph hoped to stimulate different emotional reactions, ranging from a sense of shelter to the sublime feeling people get when they encounter the immense piazza and basilica of St. Peter’s in Rome. If those comparisons seem grandiose, that was deliberate: Rudolph considered such grandiosity appropriate for this monument to the Great Society, where citizens would be positively transformed by the government’s expanding health, education, and welfare programs. Rudolph’s tour de force was a sinuous, baroque-inspired staircase that led from the interior courtyard, changed levels, and cascaded down to an exterior plaza at Staniford and Merrimac streets, where the steps broke down into a fan-shaped pavement adorned with curvilinear benches. The baroque staircase and its plaza, the interior courtyard and three sides of its terraced buildings were finished by 1971. But the times had begun to change: By end of the 1960s, the Vietnam War, political assassinations, and economic recession had altered the mood of the nation. Funding cuts in 1970 canceled construction of the tower and nautilus stairs at its base. The massive hole where the administrative tower should have stood remained a dismal downtown presence for decades. Buildings like Rudolph’s became associated with the Establishment, rather than social transformation; his career never recovered after a fire, rumored to have been set by anti-establishment protesters, devastated his Yale Art & Architecture Building in 1969. In recent years, appreciation for Rudolph’s work has rebounded, especially among young architects. His Yale building, after a fumbled reconstruction and decades of neglect, was magnificently restored in 2009. But his Government Service Center is now only a shadow of what he envisioned. The complex was conceived as a moving, celebratory place, but mistreatment has made it resemble a prison. Yards of wire fencing overzealously fence off walkway walls now deemed too low to protect pedestrians. Parked vehicles have eroded the surface of the beautiful plaza at Staniford and Merrimac. In 1999 a courthouse filled the hole where Rudolph’s social services tower was to have stood—perhaps a sign of how we increasingly look to the law, rather than aid programs, to solve social problems. Even if you appreciate Rudolph’s intent, the urban spaces of Government Center are indisputably problematic. While City Hall Plaza is, as Rudolph noted, too unstructured to provide an embracing civic environment, his courtyard ended up feeling too removed from its surroundings to draw the public inside. But both of them have qualities that a city needs, and as Boston improves Government Center, it is worth envisioning how its plazas might work better as “sequences of spaces,” fulfilling Rudolph’s 1950s call for urban complexity. His original proposals also contain suggestions for improving his complex: Rudolph’s drawings show that he intended to drape his buildings with vines, a technique that has returned to favor in today’s green architecture movement. Today, most rehabilitations of historic public buildings are privately driven: a public marketplace such as Faneuil Hall becomes a food court; the Charles Street Jail becomes a boutique hotel. Some have proposed selling City Hall to developers. But, though troubled, Government Center has the quality of being genuinely public—and its buildings, maligned as they are, are also deeply considered achievements that hold their own keys to enhancing Boston’s public life. Timothy M. Rohan is the author of “The Architecture of Paul Rudolph” (Yale University Press, 2014). He teaches architectural history at the University of Massachusetts Amherst.